What is Neuromuscular Therapy and How is it Accomplished? Neuromuscular Therapy is a specific approach to the problem of pain based on sound physiological principles and neurological laws. Neuromuscular Therapy allows a reversal of the stress-tension-pain cycle. Pressure specifically interrupts afferent impulses to the spinal cord, reduces the intensity of nervous activity within the tissue and muscle then relaxes, circulation is increased and the body returns to normal neuromuscular integrity and balance. If rehabilitation is attempted without following this order, re-injury and setbacks usually occur. For example, if an injured person attempts weight training before the hyper contractions have been properly eliminated from the tissues, the usual result is that the tissues will re-spasm and the old pain patterns will recur. What specific health problems have responded successfully to Neuromusclular Therapy? Ischemia - Lack of blood. Trigger Points - Ischemic soft tissues that when stimulated, refer high neurological activity into other parts of the body thus creating secondary pain. Nerve Compression/Entrapment - Pressure on a nerve by an osseous or cartilaginous structure/pressure on a nerve by soft tissues. Postural Distortion - Imbalance in the muscular tonus system resulting in movement of the body off the coronal and mid-sagittal planes. Biomechanical Dysfunction - Imbalance in the musculoskeletal system resulting in faulty movement patterns. There is a certain amount of occasional discomfort in any deep muscle therapy. The greatest discomfort is usually experienced after the first treatment. Mild pressure does not illicit pain in normal healthy tissue, therefore, the presence of pain during the physical manipulation of tissue is a valuable guideline to the therapist. It indicates those areas where adhesions, muscular spasms and trigger points are located. Continuous feedback from the client is encouraged to insure that the therapy is conducted with the minimum degree of pressure necessary to carry out the process successfully and achieve the maximum results. Both the nervous system and the muscular system are involved in the stress-tension-pain syndrome. Tonus is a neurological interchange between the muscle, the spinal cord and brain. In the normal state the brain maintains a low level of tonus in all muscles. Superimposed on this low level is a fluctuating level implemented by a reflex arc within the spinal cord and determined by the condition of each muscle, ligament and tendon, and by the conditions around their receptors. Receptors are specialized nerve ending which adapt our body to its immediate environment by way of input into the nervous system. In severe cases, hypertonic muscles set off a pain cycle that is neurologically facilitated and thereby becomes chronic. A law of neuro-physiology known as the Law of Facilitation states that once a nerve impulse or stimulus has traveled through a specific route, it is then easier to the next impulse to make the same passage and then for all succeeding impulses, the passage will even be easier. The pain was transmitted through a specific neurological pathway, which then became “facile” or “of easy access”. The pain then continues or refers this pathway or groove as a result of the slightest stress. 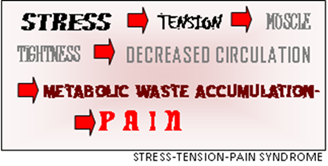 The cyclic condition of stress and tension gives rise to pain and the formation of trigger points, which may persist long after the original causation, has ceased. The trigger is the point’s strongest input to the cord and is the point of strongest motor return from the cord back to the muscle. This focus of metabolic accumulation becomes a small mass of drawn-up muscle fiber, which is tender to pressure. The trigger has command over the pain and the tension of the muscle. If the stressful condition and the resulting high intensity barrage of sensory stimulation to the cord persist, then there can be a spreading effect to to other tissues of the body remote from the trigger point site. Strong stimuli may pass up or down the cord to another segment and out to another muscle, thereby causing referred pain and malfunction. Also, hypertonic muscles can create additional complicating conditions. There is a shortening effect throughout the length if the hypertonic muscle, which results in, an increased pull at its attachments. When there is a constancy of hypertonicy in muscles on one side of the body and more nearly normal tonus on the opposite side, then the mechanically self-evident imbalance results in additional pain.